The recently released TX Text Control 18.0 Community Technology Preview (CTP) demo application is essentially the new TX Text Control Words™ with powerful mail merge capabilities. If you didn't try the CTP demo yet, I highly recommend to do it - it is amazing. Why is TX Text Control Words™ changing a lot? The new demo application is not longer only a demo. It comes with full sources and can be deployed as your mail merge template designer royalty-free. It contains all features and functionality to create highly professional templates for your reports or other mail merge documents. The predecessor TX Template Designer is not longer available and the functionality has been fully implemented into TX Text Control Words™. It is completely redesigned and offers more features such as adding database connections to SQL Servers, Access databases or any OLE DB and ODBC database adapter. And now the best part: The powerful MailMerge component, that encapsulates the whole merge process including master-detail relationship repeating blocks, will be available for the Windows Forms and WPF client versions as well. You can easily connect the MailMerge component to TextControl, WPF.TextControl or ServerTextControl. Internally, TX Text Control Words™ uses the MailMerge component to show you how easy this process is. 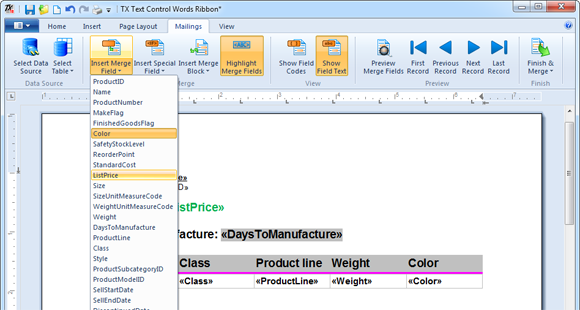 This change gives you the full power of mail merge in your Windows Forms or WPF based client applications. Let's have a look at the new Mailings tab in TX Text Control Words™. In this first step, you can select a data source. You can choose between Microsoft Access or SQL Server database files, an ODBC data source or a Microsoft SQL Server connection. After you selected a data source, the available tables are listed in the Select Table dropdown button. Finally, you can Finish & Merge the template with the selected data source. 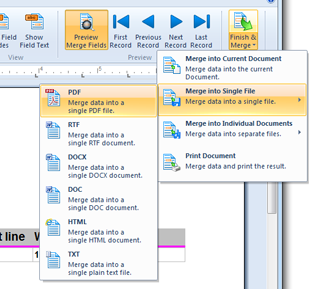 The data can be merged into the current document, you can create separate files or you can print the resulting document. This is just one of the new powerful features of TX Text Control 18.0. Give it a try and stay tuned!